When trying to calculate your home's cost, multiplication doesn't add up. 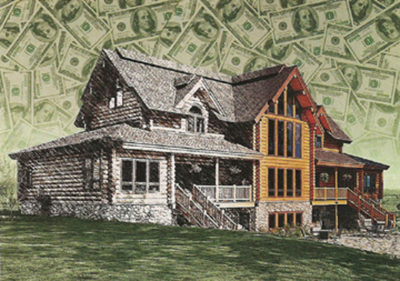 The first question people planning a log home ask is how much money they'll need. All they know for a fact is how much money they have, although some people start out not even knowing that. What's perplexing is that every house you've bought before probably had a price tag. You know right away whether you could afford it. 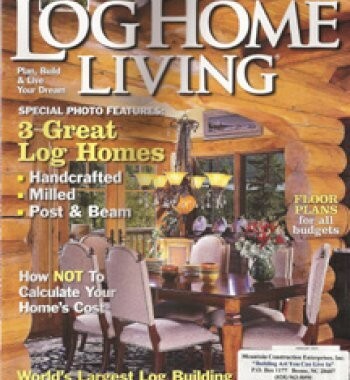 But a not-yet-built log home: Who knows what that costs? It doesn't help that the company selling the house usually isn't the one building it. And even the company selling it, probably isn't selling the whole house, just the logs--maybe including windows and doors, but maybe not. Some shoppers seeking the bottom line reckon the answer lies with the logs, which are sold as a package, or kit. Many companies advertise the package price for their standard models, usually with a floor plan and a drawing of what the finished house could look like. Let's say it's a two-story home, maybe 2,200 square feet for $67,500. How much to build it? Some companies might suggest an easy formula: Multiply the package price by 3. That works out to $202,500. Affordable. But wait. A competing log-home company is selling what looks like the same home, also 2,200 square feet, for $79,000. That's $237,000 to build. What's up? For starters, the two packages may have different contents. The size and species of the logs may differ. Even if both have windows, one might use top quality, while the other installs a no-name brand. Then there are materials that have nothing to do with the packages: metal roof or asphalt shingles, for example, or a GE refrigerator or a Sub-Zero. Among other cost variables are site excavation and hardwood floors or carpeting, if there's a fireplace, the kind of stone it uses and whether there's a log-less basement. And so on. A $67,500 package could easily cost anywhere from $202,500 (less if you do some of the work yourself) to way more than $300,000. Is your budget that elastic? Other buyers believe a smarter way to price their home is multiply its square footage by the cost per square foot to build custom homes in the area where the home's being built. This avoids the package price altogether. So, 2,200 square feet times, say, $175 a square foot equals $385,000. Ouch, but doable. Trouble is, this equation is wrong on both sides. Square footage is irrelevant to pretty much every aspect of planning, buying and building a log home (a topic in a future Money Matters), but for now here's why it's not the number to use for calculating a home's potential cost. Houses are built in three dimensions, not two, and the volume of those houses varies. A cathedral ceiling and a 10-foot ceiling cover the same square footage, but labor and materials differ widely. Whether interior walls are log or drywall and the level of amenities also affect total cost but have no bearing on square footage. Plus, size doesn't take into account the configuration of those square feet. A 3,000-square-foot box , for example, costs less to build than a 2,200 square foot home with bump-outs, dormers and multiple roof pitches. Now look at the second half of the equation, price per square foot. It isn't a guarantee, merely an average of all custom-home projects in a given area. If the average is $175 a square foot, one builder might charge $125, another $225. That's a difference of $220,000, all else being equal, which it probably isn't, because the low-ball builder may be bidding the job with lower quality materials and less skilled labor. Other variables will result in different figures. So, skip the guesswork and do your homework. That means getting bids on all materials (including your log package) and labor, plus permit fees, utility hookups, etc., and the add up everything. Then add 10 to 15 percent for unanticipated cost overruns, such as site-prep surprises, material upgrades and other changes as the project unfolds. This isn't a magic formula, but at least doing the math requires simple addition, not multiplication. Best of all, your answer will have some relationship to reality. TURN-KEY CONSTRUCTION COSTS: A PERSPECTIVE- What does it cost? What does that cost include? Why is one builder's estimate a hundred and fifty thousand dollars higher than another builder's? An Andecdotal Story: I questioned a realtor friend as to why other builders have more opportunities to quote projects than I did. He said that other builders got the client in the door by noting a price fifty dollars a square foot lower than my "Rough Initial Ball Park Price." I asked him if they built the home TURN-KEY AND COMPLETE for that price. The realtor said, "NO!" That the LOW BALL Rough Initial Ball Park Price of the other builders included the house only; the decks, grading, septic, porches, chimneys, retaining walls, and underground power were "additional" costs On Top of the cost of the house's Ball Park Price that they were using to "get the clients in the door." Many years ago, when I was thinking about bulding a construction company, I was working for a builder friend. He told me, "Building for any client is not about the price as much as it is about relationship building." Mountain Construction does custom home building in any building style, including conventional new homes, remodeling and restorations, log and timber frame home and structural insulated panel homes. Check out our site and learn more about our Construction and Remodeling services. We are NAHB Certified Green Professionals.